A good time of year to see this tiny yet noisy and energetic resident. Wren. Image by Laurie Campbell. One of my favourite garden visitors is the energetic wren (Troglodytes troglodytes), with its tail an aloft flag-pole, and those currant-black eyes. I have just been ordered back inside by a frustrated adult bird’s alarm call from the garden brambles. For such a small bird their power to warn much bigger creatures away is impressive. However, despite its size and vulnerability the wren is an indisputably plucky bird: a fast flyer with a loud voice, inhabiting Europe from the Arctic Circle down to Sicily. Its rotund stature and upright, flicking tail are the wren’s most distinctive features, as it is brown with a paler brown chest, with pale brown stripes above the eyes and a short beak. Its whirring song and clacking alarm call are also easily recognisable to anyone who spends much time in the British countryside, and can be heard on the RSPB website. The wren is an adaptable bird, and can be found in woodland, farmland, heathland, moorland and islands. It is another species grateful for mild winters, and is currently the UK’s commonest breeding bird laying high numbers of eggs. Despite this, I recommend being kind to your wren neighbours, by avoiding too much hedge pruning or ivy cutting, particularly during spring, as breeding wrens feel safe in dense coverage. Their scientific name Troglodytes troglodytes means cave-dweller, and refers to this love of dark, enclosed spaces. The wren is a follower of the “live fast” mentality, (it is difficult to measure whether it follows the “die young” element, as wrens don’t always return to the same breeding area, but it is estimated they live to around 6) as their flight involves much flapping, and only continues for short distances. Similarly their song, whilst loud, comes in short bursts as it requires so much energy from the little birds, who often quiver during its delivery. 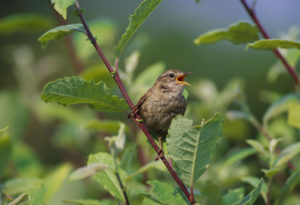 As a person who is short herself, and occasionally accused of being on the loud side, I identify with the wren, who eats little and often just like me (although I eat fewer insects, being a vegetarian myself).